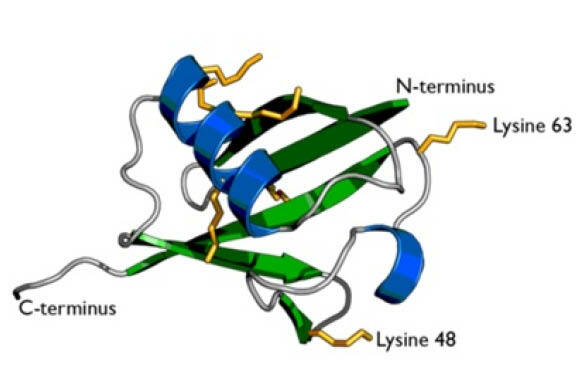 Furin belongs to the family of subtilisin-like proprotein convertases. These convertases are in charge activating latent precursor proteins, which are processed into their biologically active fragments. Furin functions as a serin endoprotease. …. and a lot more. All these factors in their activated forms are involved in several cellular mechanisms. As an example, I picked out the pathway which is triggered by Furin when activating MT1-MMP (see Figure 1). 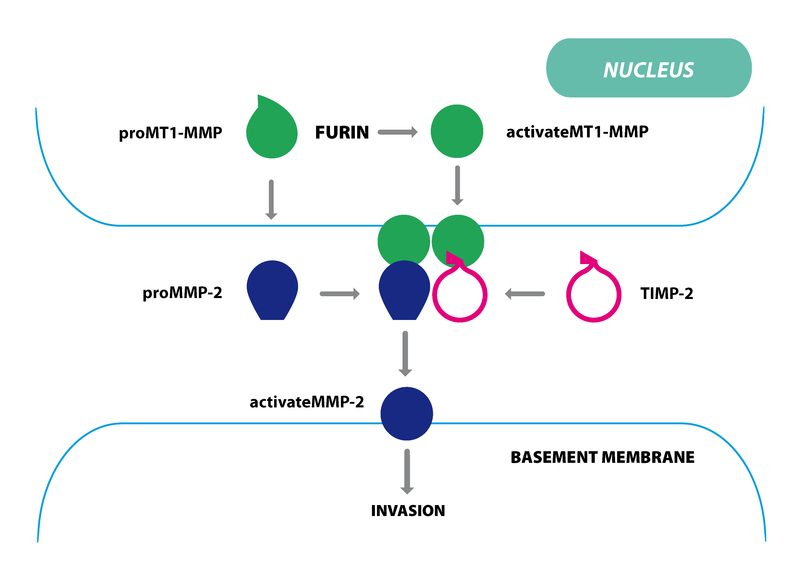 Activated MT1-MMP forms a complex with TIMP-2 on the cell surface and this complex on its part activates pro MMP-2. Active MMP-2 subsequently promotes cellular invasion. It’s obvious that Furin can play an important role in tumorigenesis by enhancing cell invasion. Naturally, Furin inhibitors have the potential to decrease proliferation and migration of cancer cells which has been most recently shown for lung adenocarcinoma cells (1). Besides the activation of cellular precursor proteins, Furin is utilized by a number of pathogens. It has been shown that, e.g., the HIV envelope polyprotein precursor gp160 is proteolytically cleaved by Furin to gp120 and gp41 prior to viral assembly (2). Envelope proteins of viruses such as Influenza and Dengue Fever Virus have to be cleaved by Furin as well. 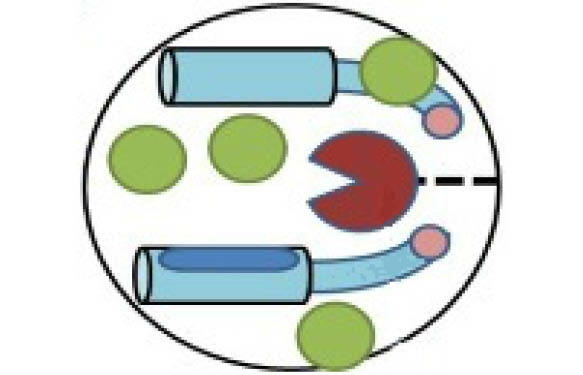 Some bacterial toxins such as Anthrax toxin and Pseudomonas toxin, as well as Papillomaviruses have to be cleaved by Furin before entering host cells. Thus, Furin inhibitors are discussed as potential therapeutics for treating Anthrax infection (3). Tools to measure Furin activity have been limited so far. The unique 3-step approach (Fig. 2) overcomes all limitations seen with FRET-based assays. 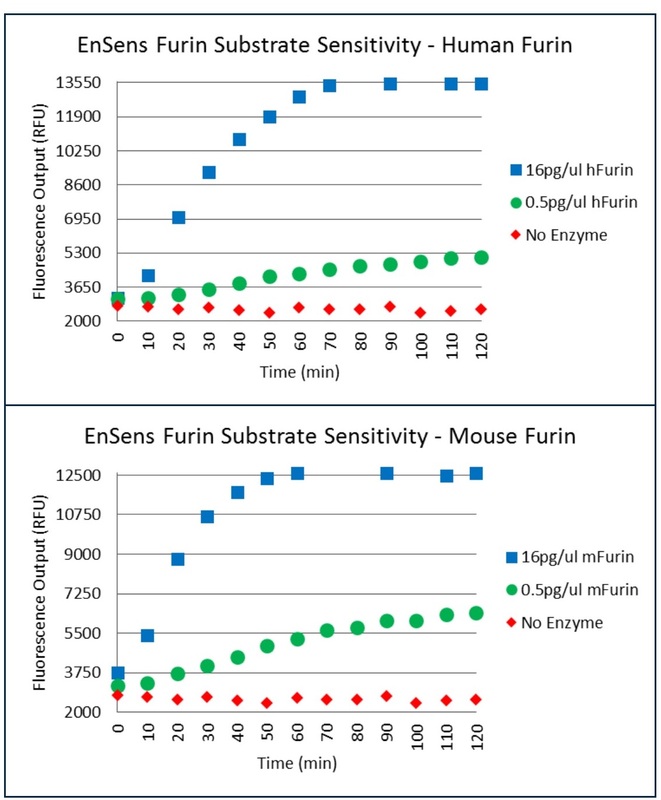 The assay is sensitive (as low as 0.5 pg/ul human or murine furin) and shows high linearity (0.5-16pg/ul; results with human and murine Furin shown in Fig 3). 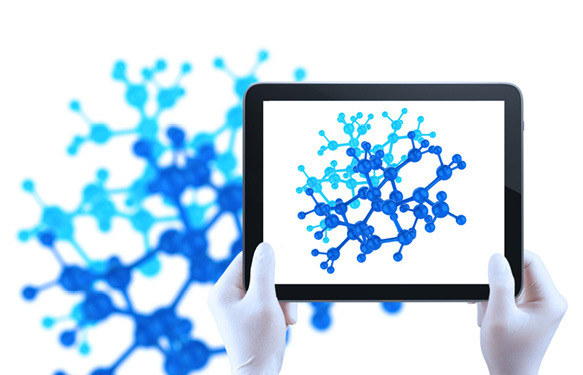 If you are interested in measuring Furin activity or screening Furin inhibitors, don’t hesitate to get in touch by leaving your comments or questions below. (1) Ma et al., Effect of Furin inhibitor on lung adenocarcinoma cell growth and metastasis, Cancer Cell International 14:43 (2014). (2) Hallenberger et al., Inhibition of furin-mediated cleavage activation of HIV-1 glycoprotein gp160, Nature 360 (6402): 358–61 (1992). (3) Shiryaev et al., Targeting host cell furin proprotein convertases as a therapeutic strategy against bacterial toxins and viral pathogens, J. Biol. Chem. 282 (29): 20847–53 (2007). Im looking for a kit that can be used to measure the Furin and other pro-protein convertase activity in a breast cancer cell lines! I have just found the EnSens Furin Activity Detection Kit in your website so im wondering how could I order this and is it straightforward or cells need to be transfected …etc ? 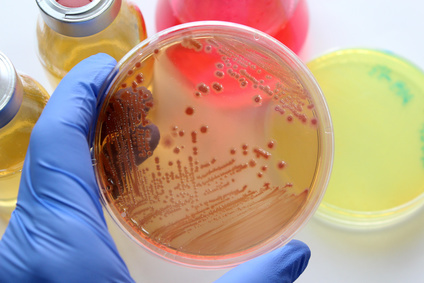 All the EnSens® Protease Assay (Enzium) are available in Europe via tebu-bio. You can contact my colleagues in the UK at tebu-bio Ltd in Peterborough (Tel: +44 (0)1733 421880 or uk@tebu-bio.com) for any further assistance. Regarding the experimental procedure, you do not need to transfect your cells. After treating and cultivating the breast cancer cell lines in various conditions, you run cell lysis. The lysates are then mixed with the reagents of the kit (including the substrate). If a cell lysate contains Furin activity, the substrate is cleaved leading to fluorescence.